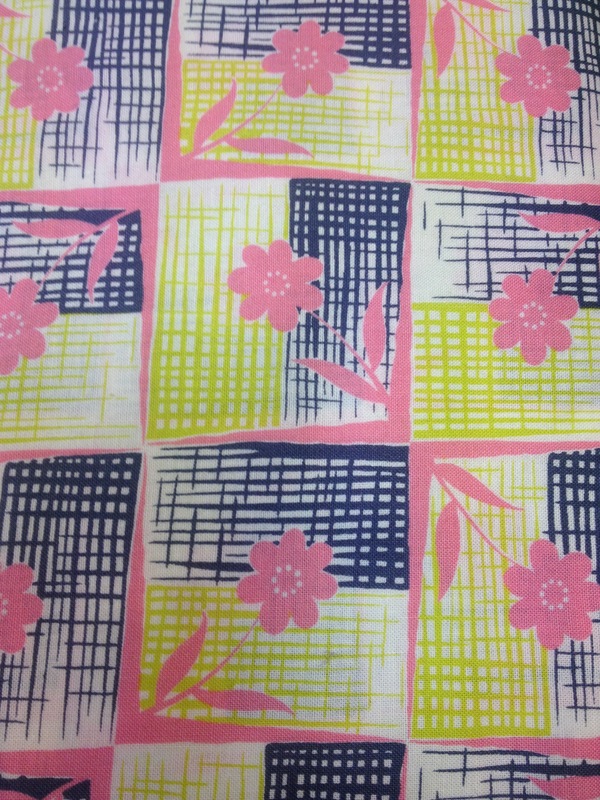 If you are in the market for reproduction fifties style fabric, perhaps a source you haven’t considered is right under your nose – your local quilting shop. Admittedly, I live pretty close to one of the best in Australia’s: Material Obsession, at Drummoyne. Their selection is mouthwatering. 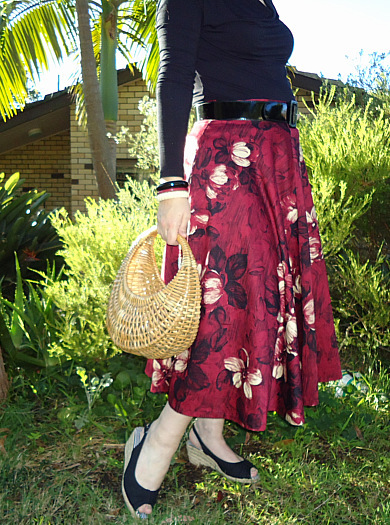 Here are a few things I spotted in there recently that I thought might work for fifties style garments. I didn’t take any notes about the fabrics, all I can say is get in there fast as they sell out fast and not always reordered, so the lovely lady who helped me could tell me. I was extremely lucky to find the scarlet print with the bows was still in stock – I have been dreaming about it since the last time I visited – months ago. I think it will be perfect in a blouse like Butterick 4985. If you are in Sydney’s Western Suburbs I recommend Fred the Needle – I haven’t visited them in their new location in Dural – but their Penrith store was fabulous. If you have a good one one near you – I would love to hear about it. Also if you have tried sewing garments with quilting fabric and how that went. Thanks. It’s the second week of the school holidays and I just heard the little guy say, as he tumbled around the living room “I can feel my brain moving” – had better go. Another trip to the dentist with the big boy today so we visited two op shops out of our neighbourhood. 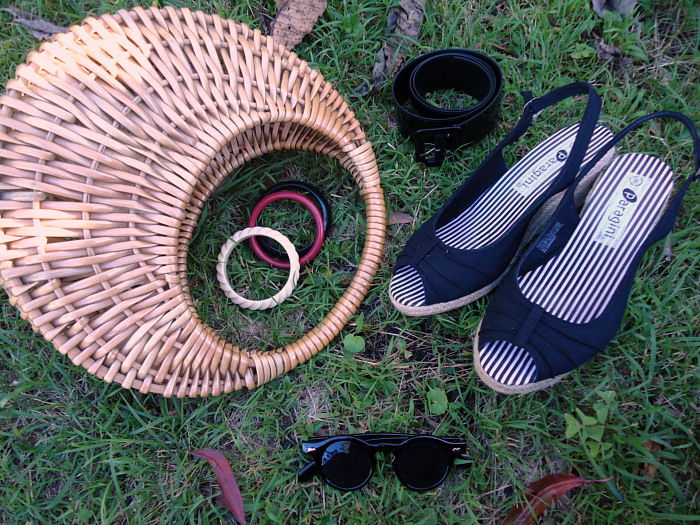 He doesn’t mind visiting an op shop and he found two pairs of All Stars (sneakers) and one pair of Vans – nice! I got some patterns which I shall show you on another day – but how do you like this? I think its very Fifties – because of its hand painted look. 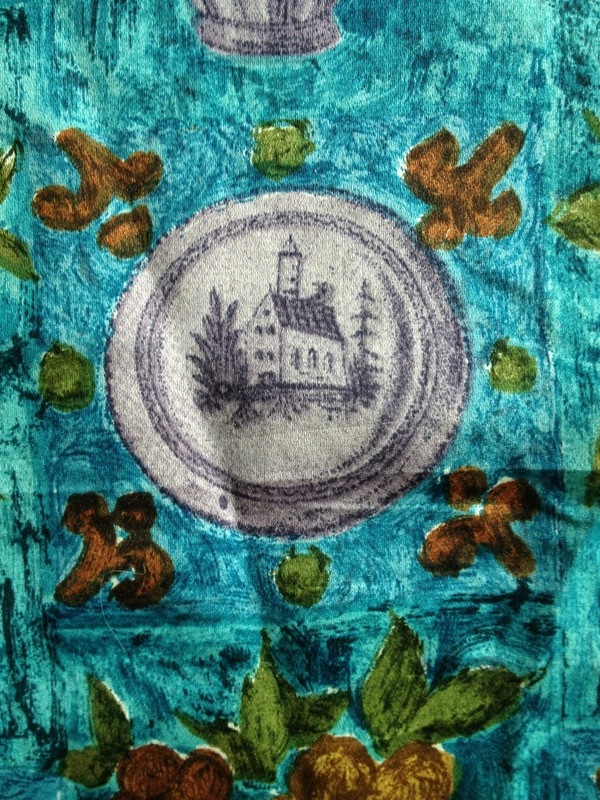 The subject matter pictures what I assume are supposed to be Delft Ceramics – which are white and blue – but look lovely in the grey tones. 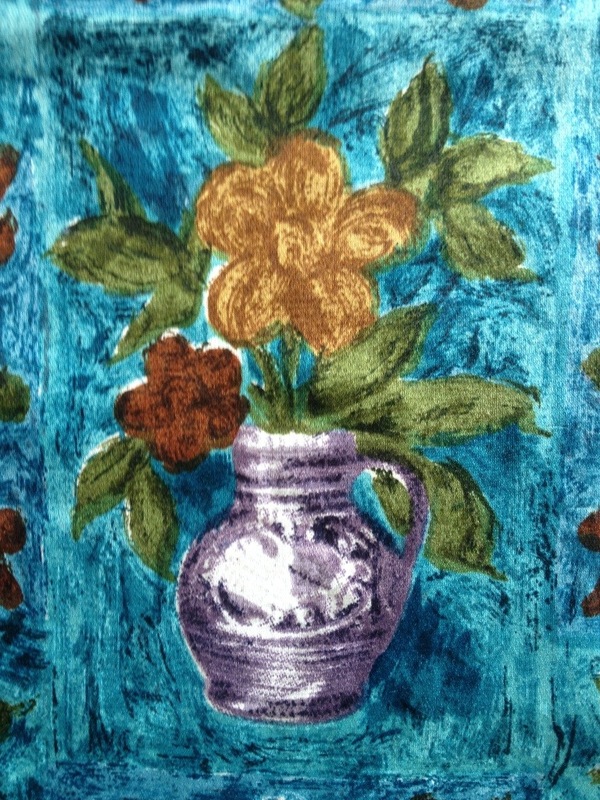 There is a subtle tile pattern in the teal background – can you see it? I will have to make it up into a little top and see if my Tiler husband gets the joke! It was a bit of a bargain 90 cms wide (definitely vintage) 1.5m in length for $6.50! 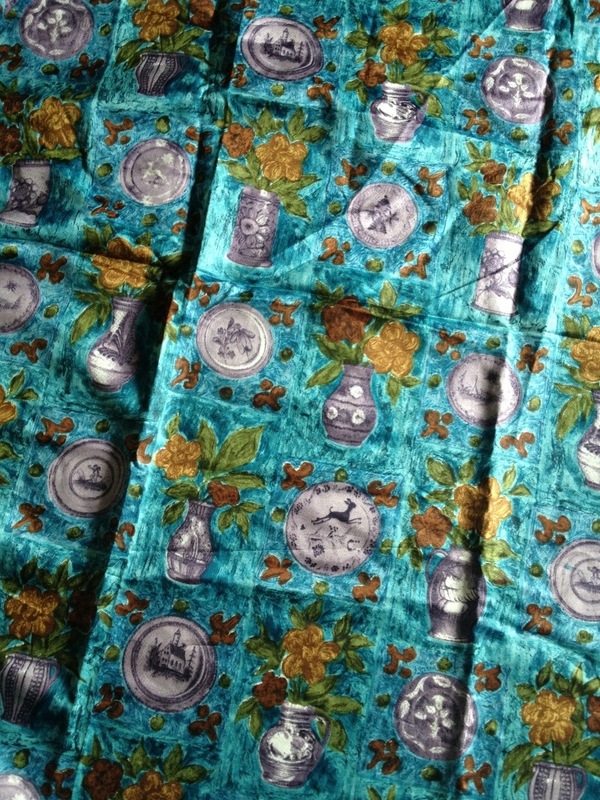 The fabric is cotton but has a lovely sheen to it – because it’s a sateen weave. You can feel the difference when you run your fingers over from top to bottom (it’s smoother) and across (more rough). Still not much sewing going on around here – ok none! It’s still T-shirt weather in Sydney – the mornings are cooler but the afternoons still in the high twenties – it’s lovely actually. The big boy had to have an adult tooth removed – it was weakened by Asthma drugs as a baby and was never going to be any good – no matter what we did to it. He was a little anxious on the chair and started to hyperventilate (just like I did as a kid). The retail therapy improved his mood – like mother like son! Hope you get some sewing done this weekend! This picture shows some of what’s in my head. A frustrated desire to sew, what I am actually doing (selling vintage wares on eBay) and what’s coming up – a trip to Bali in a while. 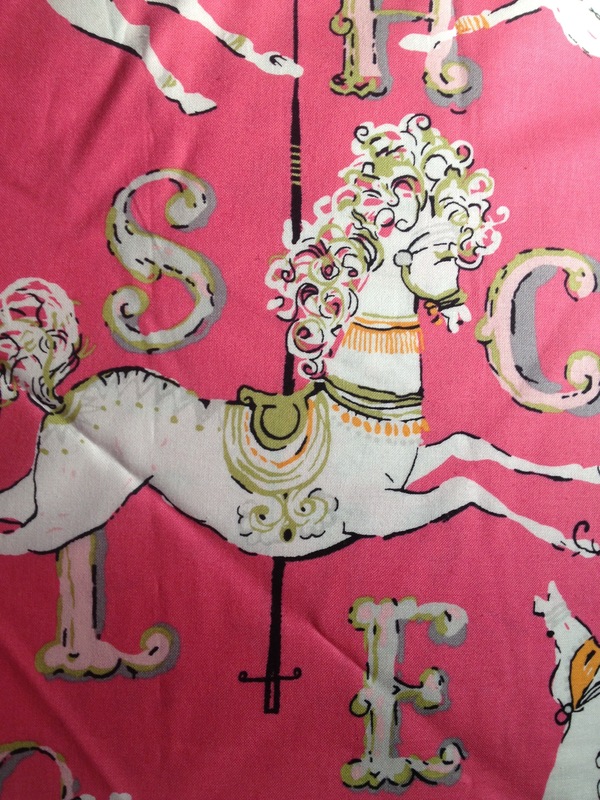 Do you like this cute T-shirt I got on sale at Target recently? I like its licorice allsorts stripes but the best thing about is the cut. The body is cut like a singlet – with a small folded cap sleeve inserted – it has a very flattering effect for ladies with large arms! I am going to attempt to replicate this design. 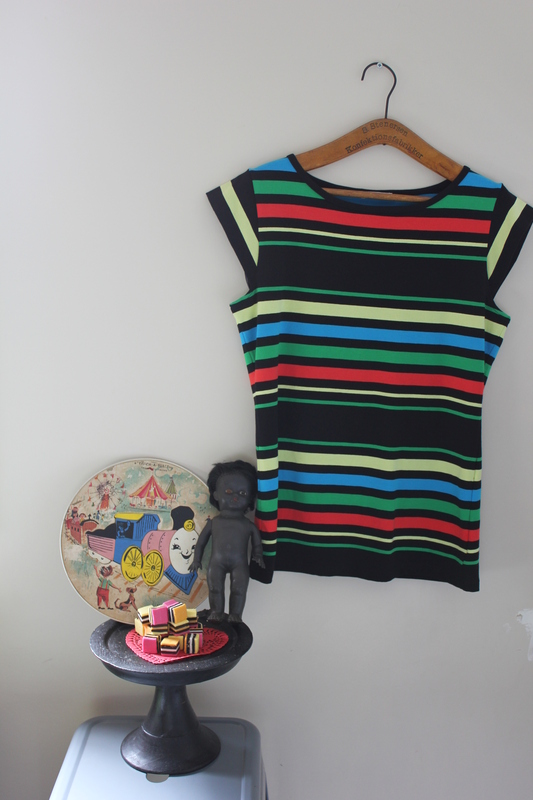 If you have a favourite t-shirt that is the perfect cut for you I recommend taking a pattern off it – usually simple even for a beginner pattern maker – just lay it flat and trace around. The front is usually lower than the back. Then add seam allowances. One I had two layers at the front so finishing the neck edge was not a problem as you sewed the neckline first then cut nicks into the seam area, then turn it through and attach the back at the shoulders and the sides. Sing out if you need visual help and I will put something together. Or you but that binding elastic stuff – which makes finishing raw edges fun. I have been feeling so guilty about not blogging recently but my real job has been very busy with trips to Newcastle several times, new store opening set ups, getting the kids settled in with their new teachers and my eldest is off on his first camp next week – much anticipation about that! Mark has been away in Wollongong this week so that is big and adds pressure. And I was helping organize a school event – which meant lots of meetings – emails – phone calls and then supervision of the jumping castle for hours on Friday night. The kids loved it though. 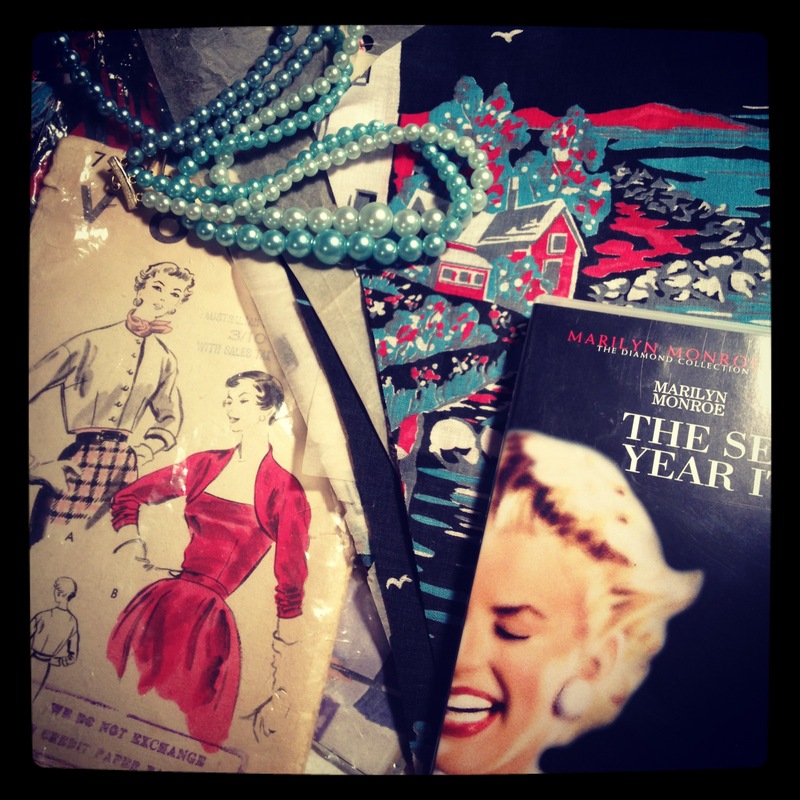 I have also been listing lots of vintage goodies on eBay (might do a blog post about that). We are off on our first ever trip to Singapore and Bali with Mark’s sister and her family soon and I am trying to make some spending money. I am dreaming about lots of dinners out, the kids swimming all day and reading books – doesn’t that sound like bliss? 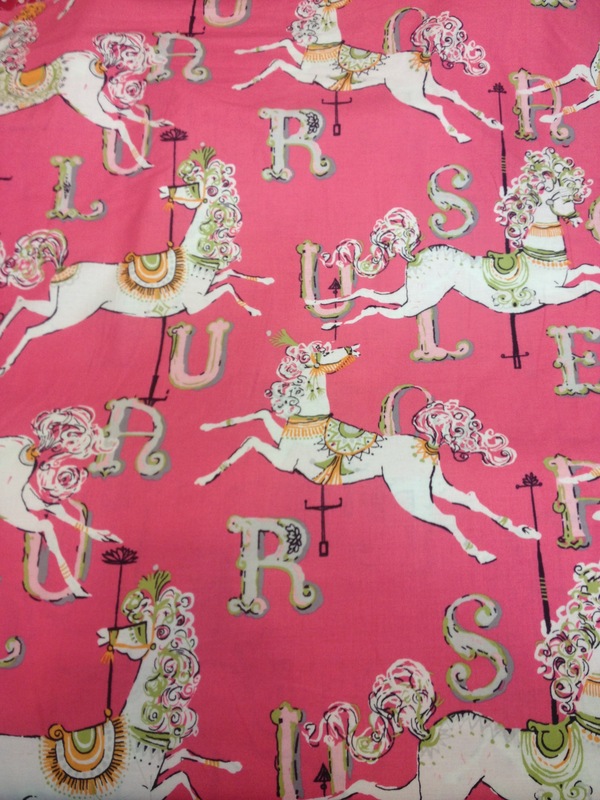 Oh and I have a tonne of fabric that I want to get made in to clothes – I know it’s cheating but I think its a brilliant way to bust my stash! Notions: Art deco glass diamante buttons from the stash. 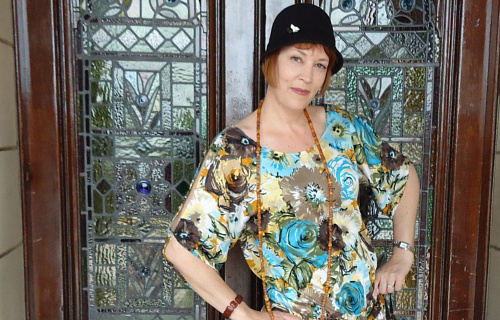 I wasn’t going to bother taking part in the Sew Weekly’s Gatsby week for a couple of reasons. Firstly, my idea of Gatsby fashion is skewed more 20’s than the 30’s frocks Mena and her friends wear to the Gatsby Weekend. I feel I know almost nothing about 1930’s fashion except for bias cut satin evening gowns, and there is no way I am going there! Secondly, there is nothing less flattering that a drop gathered waist on a woman with heavy hips and thighs. 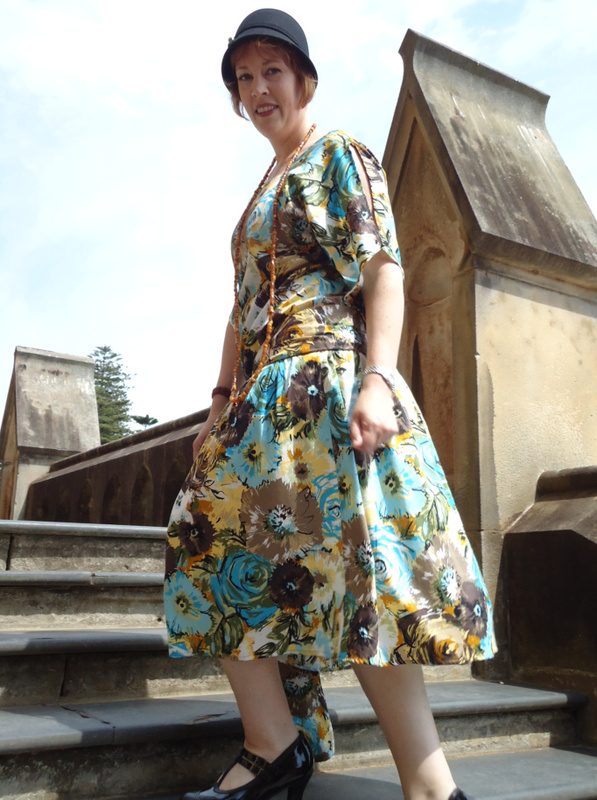 However, the Sew Weekly contributors’ efforts for Gatsby Week were so inspiring that I thought I’d have a crack at it! 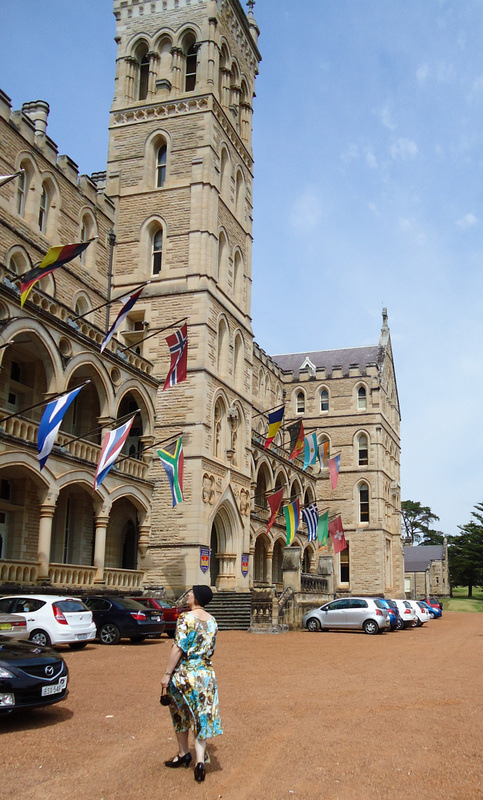 Also, a few months ago, scenes from The Great Gatsby movie were shot at St Patricks Seminary in Manly – half an hour away from my house in Sydney – what an opportunity! With a house full of international guests – I was keen to work in a little photo shoot to a spot of sightseeing with coffee! 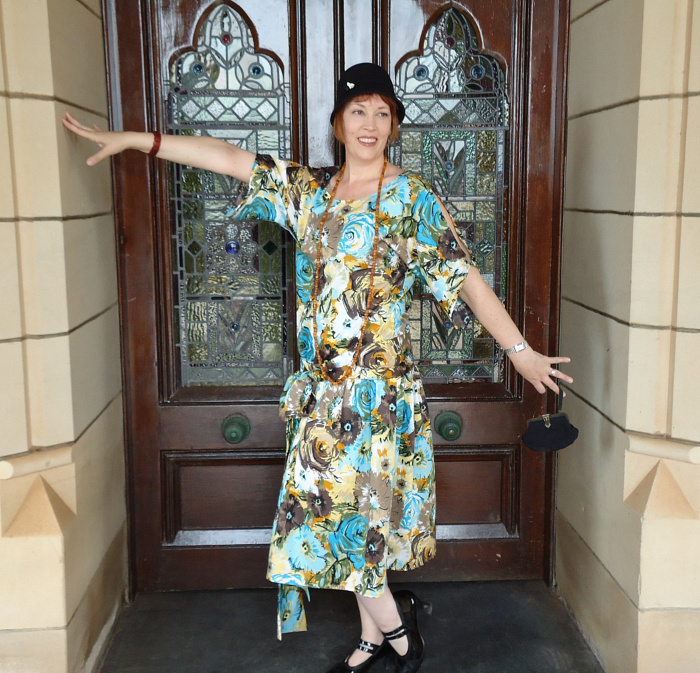 The stars aligned, I found cloche hat, and I even managed to get my hair bobbed in time for the photos! The Seminary can be seen early on in the trailer, with its ivy covered walls, it has undergone a dramatic transformation into a castle in post production! I was thinking of buying the famous 1920’s One-Hour Flapper Dress but I am too stingy to pay for what is a very simple pattern! 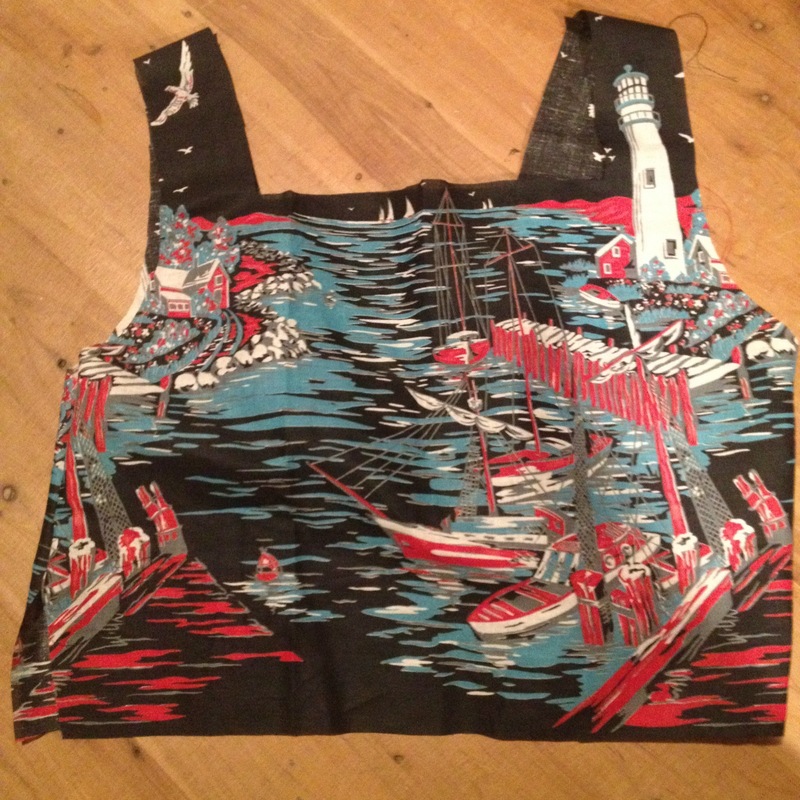 So a few weeks ago I was pleased to find this very ugly-looking 80’s dress. I thought it would probably work – when you have been patternmaking and sewing for years, you develop the skill of being able to see how the pattern pieces go together and what they will look like. Beginner sewers – take heart, this takes time. This patterns wins the prize goes for worst pattern illustration ever. I saw that there were no shoulder pads to give that exaggerated shoulder line and I knew it wouldn’t sit like that, or do I just have broad shoulders!? I eliminated the centre front button placket and cut it in one piece. I extended the sleeves, following the angle they were on, and sewed just to the end of my shoulders. All the edges and hems were sewn with rolled hems. I wanted a floaty sleeve, with an open top arm seam. We are going to Bali next year. The Balinese are unimpressed by the display of armpits – I hope this dress will be acceptable – light floaty and no visible underarm! I finished them with a pair of little art deco glass diamante buttons from the stash. A trick for minimizing the hippage, I recommend is to give it a good press, with the focus on the gathers. I wanted them to sit flat – rather than billowing out – adding volume where none was welcome. 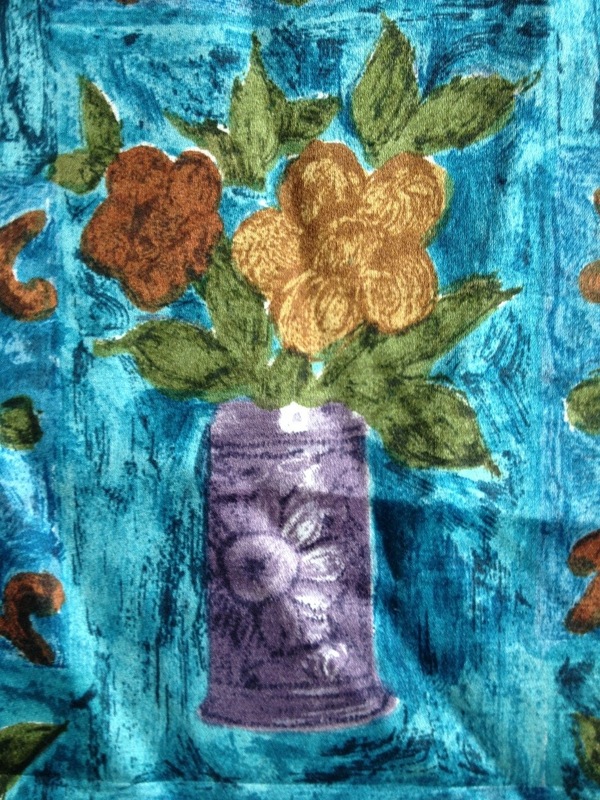 This fabric was wonderful to sew – it is a very fine twill weave – perhaps a foulard. 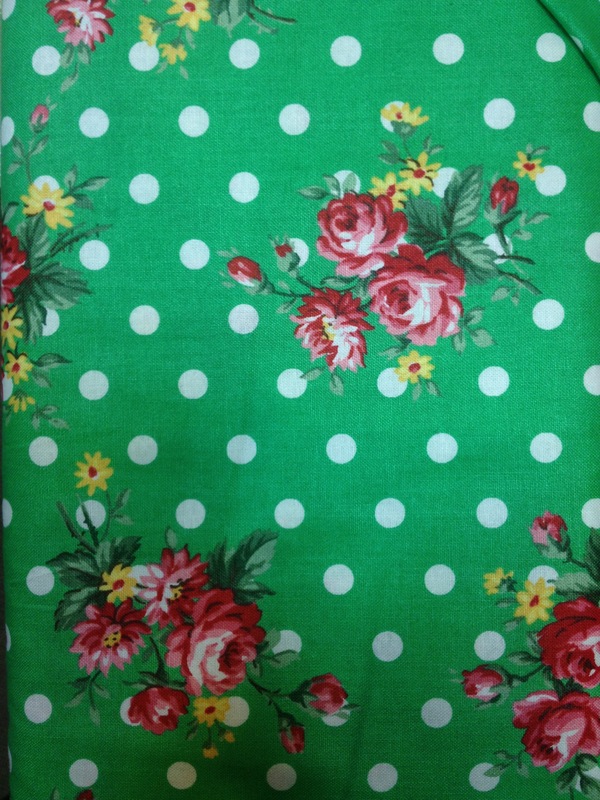 I realize that the fabric is more 50’s in feel than any other era- but that is my thing isn’t it! My dad took the photos for this shoot. We were up against it. It was windy again and the camera’s display is broken – so he really couldn’t see a thing – He did pretty well though and was very patient to take 250 photos!! Mum was great at directing the photo shoot. Thanks Mum and Dad! I am sure you know that Australian Film Maker Baz Luhrmann, Director, and his wife Catherine Martin, Production Designer, are creative collaborators in this movie. Baz with his amazing vision and kooky musical inspiration and Catherine with her incredible attention to detail – I salute you. 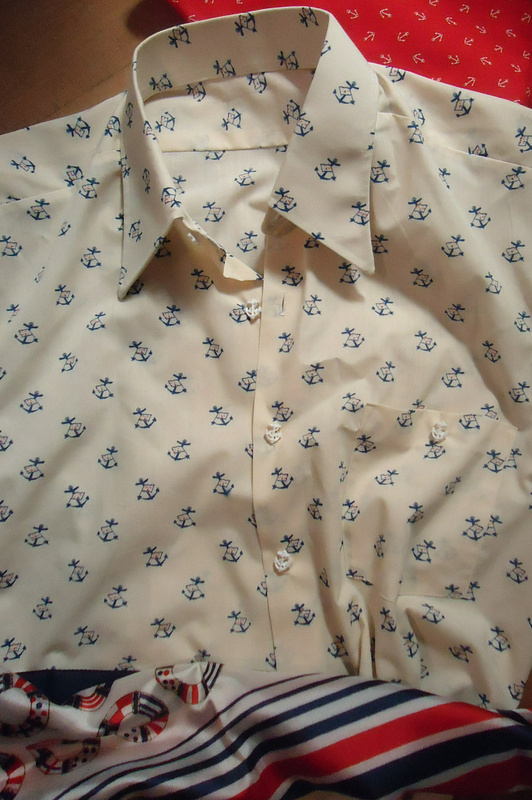 I have written about my family’s affinity for the sea before but I haven’t worn anchors since I wore big plastic earrings with neon yellow mesh ankle socks one Christmas Day in the 1980’s. My Dad’s diver mates gave such a hard time that day, about the anchors, that I doubt if I ever wore them again. I found this shirt in a local oppy for $11 . It had a couple of tiny red paint dots on the front which probably explains why it appears to be unworn genuine 1970’s vintage. Score! 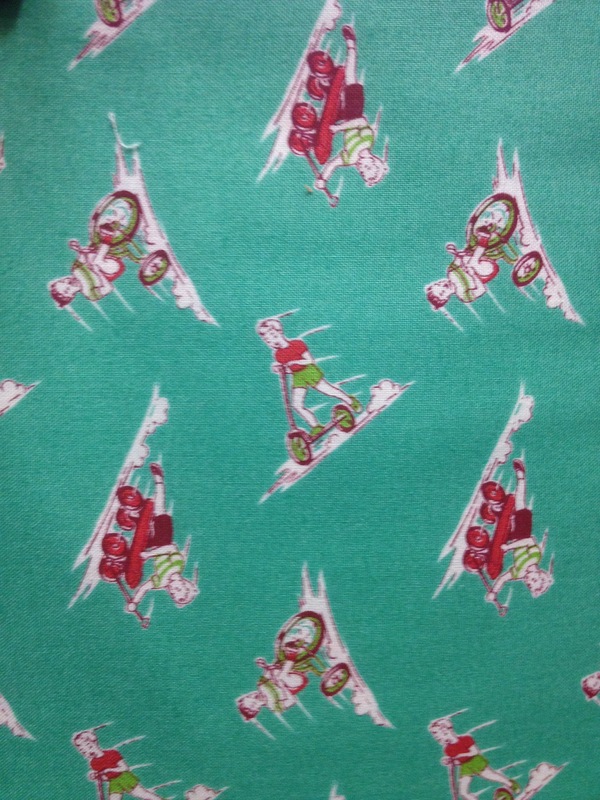 The Bandana fabric I also picked up for $1. It a polyester/cotton. 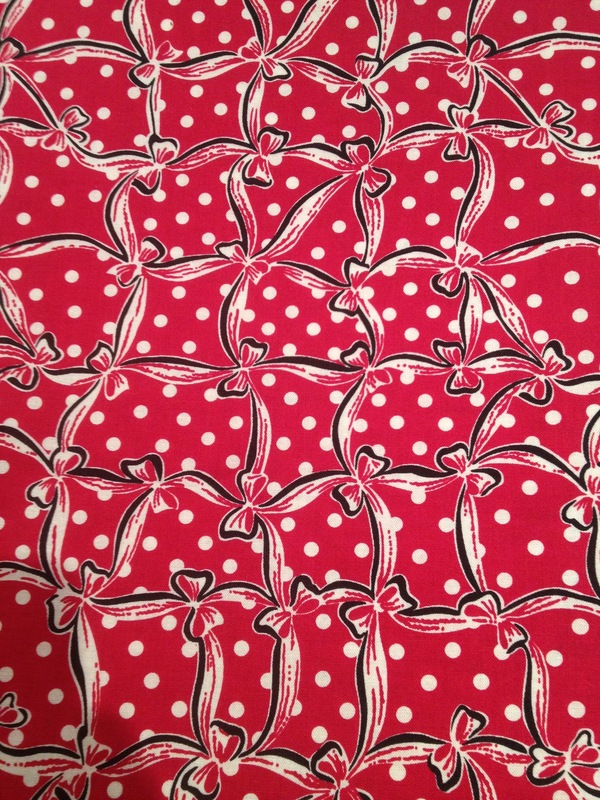 Heavy on the polyester – unwearable in my opinion – but OK for a headscarf for a bit! After I washed it, Mum helped me to pin out darts in the back. I did the front ones and pinned in the side seams – making the shape more feminine. The rule of darts and fitting is that you take out the same amount on either side so they are even. I did two little embroidery polka dots to cover up the paint marks. 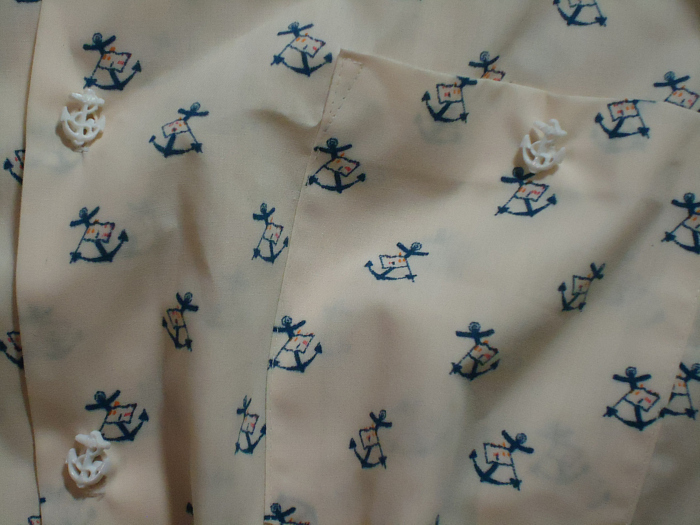 I changed the buttons to these fabulous anchor buttons I picked up in NZ. It was a nice easy up-cycle. I recommend asking your Mum, or a friend to help with pinning out your back darts – it’s so much easier than trying to do this yourself! 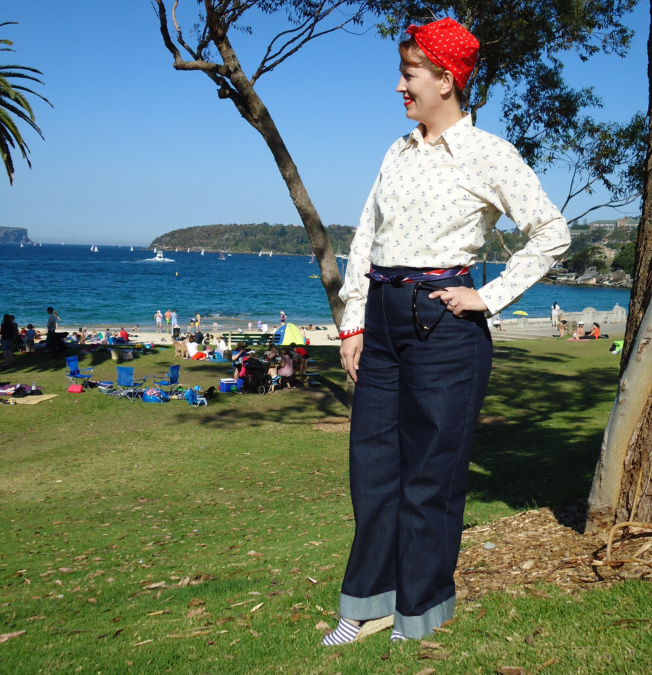 I am wearing the “Cats Meow” Jeans that I made back in May for 40’s Week. I have worn these a lot. My Mum has been staying for a 5 weeks (Dad and my brother a week) helping me out but last Saturday we waved them all on their way, my parents touring up to Queensland and my brother back to Scotland for work as a diver in the North Sea. Its been lovely having all my family around – weigh the anchor! 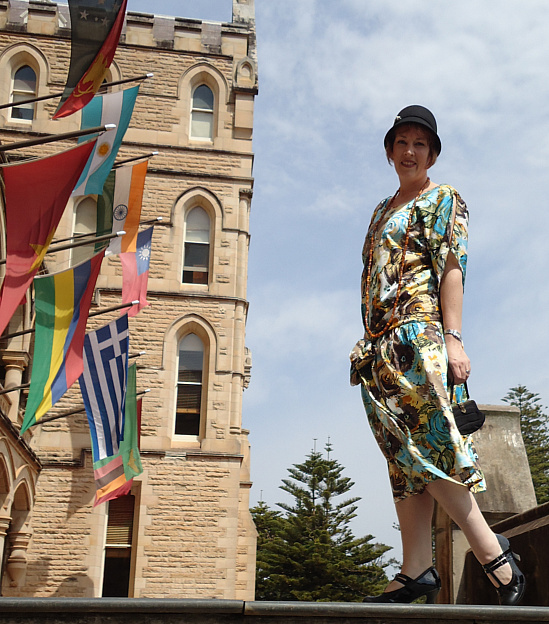 Thanks to my brother Gav, for taking the photos at Balmoral Beach (not far from where Mark and I got married by the Rotunda there) – it was quite windy that afternoon and crowded as you can see. I tried to disappear behind a palm tree and not attract too much attention! 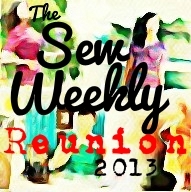 I have been trying desperately to keep up with Sew Weekly challenges lately – and failing! 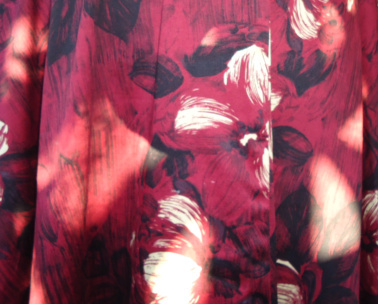 I have made a blouse for the Olympics Week – and a skirt which still needs a zip inserted for the “Yellow Week”. But I am overwhelmed by the thought of doing yet another solo photo shoot or using my mannequin, again! 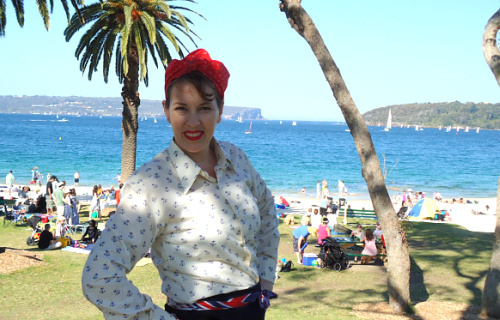 Truth is, I am a little distracted by thoughts of the Fifties Fair – coming up on 26th August. What do you think? 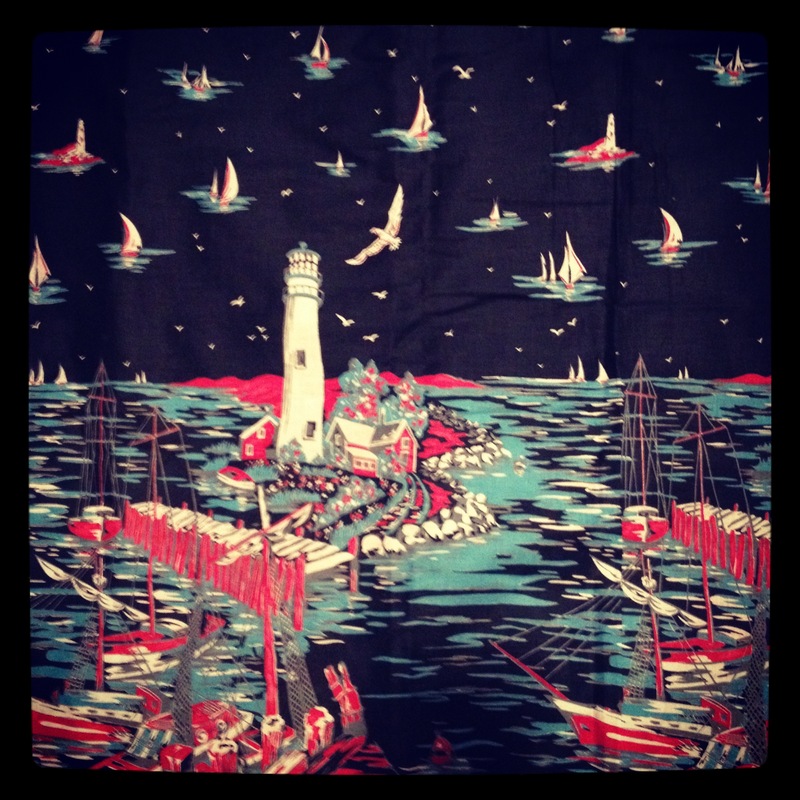 It’s a different colourway of Mena’s Lighthousey “Dark Nautical” Fabric! It was on Ebay and I negotiated the price down and ended up getting 5 metres for about $50 including postage – bargain right?! I love its depiction of a New England Fishing Village. Maybe one day I will travel there? I love a black background, and a splash of red. I am attempting a dress with a bolero. 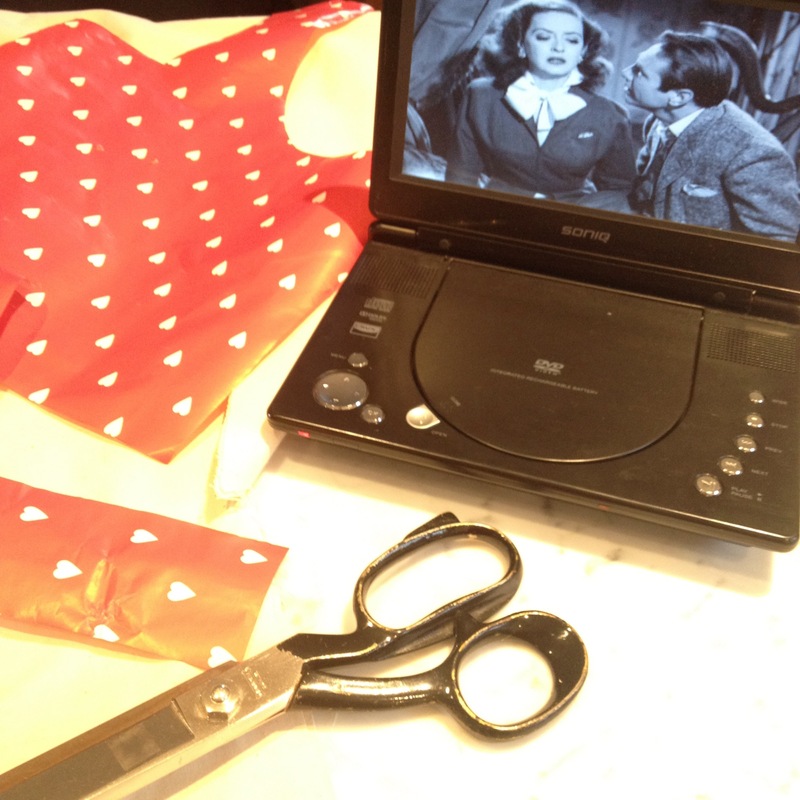 I like to watch old movies while I sew – they keep me company. This week I watched “The Seven Year Itch” – which is really funny – if you havent seen it. Also appropriate to mark the 50th anniversary of Marilyn Monroe’s passing. And “All About Eve” – a fascinating portrayal of selfish ambition! I really have a lot of sewing to do – I will try to put some more progress shots on: Instagram under: quiet_vintage_sewing – I hope you don’t become as addicted to this ap as I have!! During the middle of my photo shoot – i.e. me with camera set on self-timer and using a chair on the trampoline as a tripod, a magpie broke into my house. My youngest son was panicking and screaming as it flapped about trying to get out – I opened a latch on a window and shoved the glass, but the window was stuck so I broke the glass and knocked over a vase of flowers! He made such mess pooing (the bird not my son) from one end of the house to the other, on the carpet, on a book, on clean washing! Argghh I could have wrung his neck! Luckily I didn’t cut myself and there was no serious damage. So I am not smiling in these photo – I am fuming! 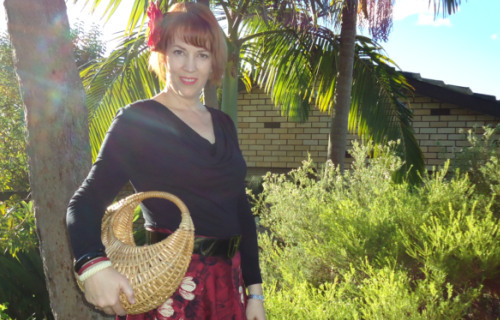 I bet you are fuming too because, guess what – I have made this boring skirt three times! Oh yes, and it’s even a UFO so all I had to do was take off the too small waist band and re-attach because its taken me making this skirt three times to work out what my waist measurement is! We are careering towards the end of the kids second term and we are tired! I work three days during school hours and there are speeches for 6 year olds (ridiculous right??) and projects for 9 year olds. The laundry is piling up around the place and its been wet all week so it is taking over our living spaces! Oh yes and my husband is at work for the twelfth day straight! First world problems right?! 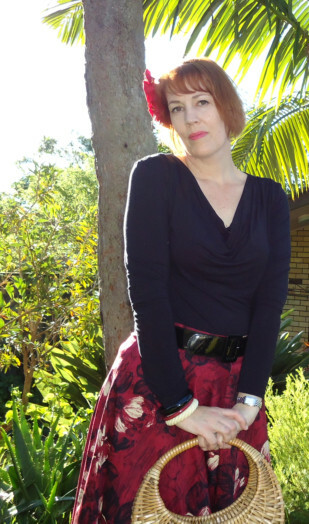 Being grateful helps me when I am whining so here goes; I have a garden where Birds of Paradise are in flower, the Sydney sky was blue for the first time in days, for the photos, my camera has a self-timer and this skirt is finally finished. I really like that print. 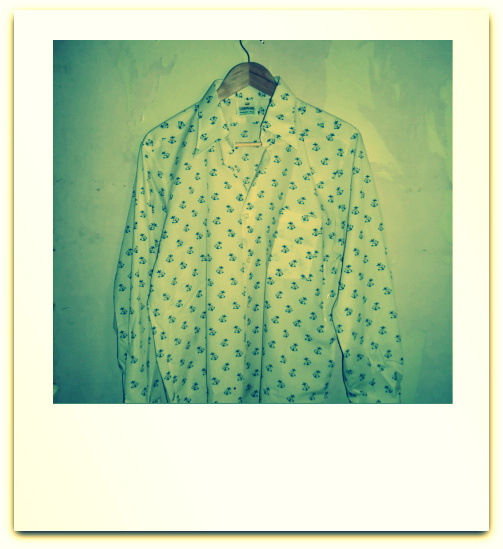 It is the exact colour palette of one of my Dads 1960’s Hawaiian shirts that I used to wear when I was a teenager. It was a remnant so I didn’t have enough to make a dress and I wasn’t even able to piece together a top, despite quite a bit of time spend trying – which is probably why I abandoned this for 6 months – hours of sewing getting me nowhere is incredibly off-putting. I might get some laces for some platform shoes from the scraps – we’ll see. If I were going on a lovely tropical holiday or a Tiki Party – this is the kind of thing I’d like to wear. Dreams are free! Oh and I found a tripod at an op shop for $12 this week – score!